The Smurfs is now showing in theaters everywhere! Have you seen the movie? I haven't, but I will! And I have to make sure my nails are ready when I do. I literally did my Smurfs nail art design on installment for 2 days because of time constraints. This is another nail design that I personally painted by hand. I had a difficult time deciding on the background color. I was deliberating on using white, light blue, and light gray. But something happened while I was trying to choose my base color. A package arrived, containing 3 nail polishes that I recently ordered online from Digital Traincase! It included a bottle of Essie Mink Muffs and immediately (really!) decided to use that in 2 coats for base color. I think the neutral shade of Mink Muffs made the Smurfs or the design pop. All the characters were painted using acrylic paint. I also thought of just having an accent nail for both hands for this nail design. However, I found myself amused after doing one nail that I decided that these cute blue cartoon characters deserves more. So I decided to paint a character on all 10 fingernails! I know that it would take time for me to finish, but I also know that I would enjoy the challenge. Papa Smurf belongs to my left thumb and I painted the Smurfs' most famous enemy -- Gargamel, on my right thumb. After I finished Papa Smurf, I realized that I got disoriented. I honestly him and Gargamel face to face when I put my 2 thumbs side by side. I already sealed my Papa Smurf with top coat so I really didn't want to repeat it for the sake of position. I remember my sister and I used to collect small Smurfs figurines when we were kids. I wonder where they are now. This also made me realize that the Smurfs have been around for quite a long ... long time! And I really do find them adorable. To make the nail design more interesting, I painted the different Smurfs with different facial expressions. I even painted a Smurf at my left hand pinky in sideview angle. I found it really cute when I was done painting him. I added 2 mushroom houses too, one on each hand. I just can't let this Smurfs' nail art pass by without those colorful cottages. And since I included Gargamel, his vicious cat Azrael should be there! He's on my right pointer finger. No, I haven't forgotten to mention Smurfette. She's one of the 3 females in the Smurfs' village, but I think she's most famous one. I actually painted her first as I almost always start with my index finger on my left hand when I create nail designs. I was able to take photos of how I painted Smurfette and Papa Smurf. 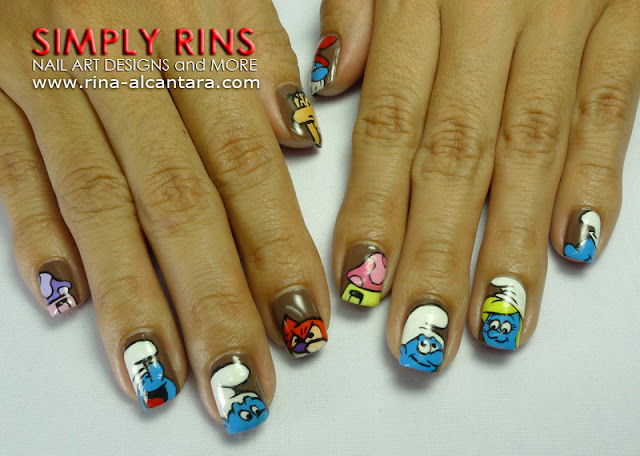 I will be publishing a Smurf nail art tutorial on a separate post. Hopefully, it would inspire you to try freehand nail painting. The tutorial would also showcase how I paint cartoon characters. I will be including personal tips. Don't forget to subscribe so as not to miss on future posts. I hope you enjoyed this Smurfs nail art design as much as I enjoyed doing it. What do you think? Oh my gosh! I love this nail art. It is Smurf-tacular! Rina!! This is sooo cute! You're really one of the, if not, the best nail art diva in town! This is briliant Rina. Every nail is absolutely flawless! They are perfect! You're so good!!! They look incredible! So realistic and nicely done. Thank you smurfy much! It's a nice feeling to see other nail enthusiasts appreciate my nail designs. Can I just say, that nail art diva remark will forever make me giggle with joy! Thank you! I smurf it too! ;) The expression is contagious after I watched the movie last night! Thank you! I'd like to believe that my skills are improving because all of you keeps inspiring me! Thank you! Do you have a favorite Smurf? Oh no! They might come alive out of my nails! Those blue characters are amazing. I'm happy that I was able to paint them on my nails and that you liked it. Thank you! I have no words to descrive your job... your freehand nail art is amazing. All the characters are perfect... I love your blog.